Execution Dock à Wapping était un espace performatif sur la Tamise à Londres ; un endroit où des pirates et d’autres criminels nautiques étaient exécutés en public par pendaison. Wapping était le site où la justice maritime était vue et exhibée afin d’avertir les autres de l’omnipotence de l’amirauté anglaise. À marée basse, un représentant du Premier Amiral emmenait les condamnés au gibet, leurs corps pouvant rester exposés en public. À travers les textes littéraires et non-littéraires cet article examine les représentations d’une telle justice pour les pirates, au début des temps modernes anglais, période à laquelle le mot « pirate » était une expression très inexacte et fluctuante. La carrière d’un pirate pouvait finir de plusieurs façons : l’emprisonnement, une amende, la torture, l’exécution par pendaison, une libération négociée, un pardon royal, l’évasion, l’exil ou une retraite respectable. Une telle fin dépendait, sans doute, du genre et de la classe sociale, mais elle dépendait également de l’opportunisme politique, de la politique étrangère et des facteurs économiques. On trouve aussi des divergences énormes entre la vérité historique et les représentations des pirates dans les textes littéraires. Bandit ou héros, le pirate des XVIe-XVIIe siècles était à la fois adroit et ambigu. Execution Dock at Wapping was a performative space on the Thames River in London where pirates and other sea criminals were publicly executed by hanging. Wapping was the place where nautical justice was seen and put on display, in order to warn others of the omnipotence of the English Admiralty. 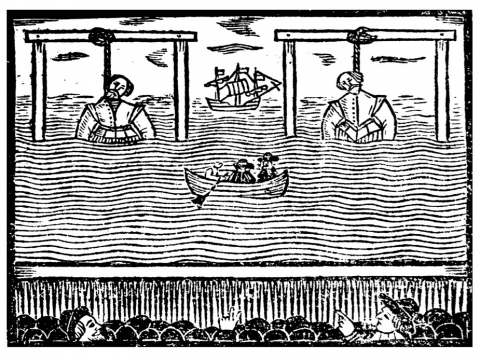 A representative of the Lord Admiral led the condemned to the gallows at low tide and their bodies remained on public display. This paper looks at the representation of such pirate justice in a number of the literary and non-literary texts of the early modern period in England; when piracy itself was a very fluid and inexact term. A pirate’s career could end in a number of ways: imprisonment, fines, torture, execution by hanging, a negotiated release, a royal pardon, escape, exile or respectable retirement. Such an end result could well depend on gender and class, but it could also depend on political expediency, foreign policy and economic factors. We also find huge divergences between historical truth and the literary representations of pirates. Villain or hero the pirate of the XVIth and XVIIth centuries was both adroit and ambiguous. 1This paper looks at the textual coverage of pirate executions in the Elizabethan and early Jacobean period – we can still see the hangman’s noose at The Prospect of Whitby pub in London. Situated on the river Thames at Wapping this gibbet is all that remains of Execution Dock, the place where English pirates and smugglers were executed between 1400 and 1830 (fig. 1). 1 John Stow, Survey of London, London, John Wolfe, 1598, p. 347. 3 Samuel Rowlands, The Knave of Harts, « Epilogue », London, T.S., 1612, lines 13-18. 3Wapping was a performative space on the River Thames where the state’s justice was seen and put on display for public consumption, in order to warn others of the omnipotence of the Monarch’s power. This is probably why many executions took place on a Saturday4. In this paper, we will first give a description of Execution Dock, its gallows and the ritual of execution. We will then look at the cases of a number of pirates, in particular Purser and Clinton, whose stories were told, and re-told, in the literary and non-literary texts of the XVIth and XVIIth centuries. These cases will be viewed against the historical and political backdrop of the Elizabethan and Jacobean periods. However, one point needs to be clarified first; the definition of the term « pirate » and how the position of such sea-rovers changed from Elizabeth’s reign to that of James’s. 7 Of Pirates, Empire, and Terror: An Interview with Lauren Benton and Dan Edelstein, p. 75. 4In the earlier period at which we look the definition of pirate was vague and ambiguous. Between 1580-1630 the category of pirate included pirates, sea-rovers, corsairs, renegades, buccaneers, filibusters and privateers5. The first six terms all mean « pirate » but a privateer, or private-man-of-war, or, alternatively, « discriminating pirate6 » was slightly different. The term itself did not appear till the mid-XVIIth century and it defines a pirate hired by the state for foreign affairs. He carried letters of marque, sometimes called commissions, issued by the monarch, admiralty or other government official which proved the joint nature of their business and the so-called « legality » of the pirate’s venture. As Lauren Benton notes: « pirates were sophisticated legal actors. Far from embracing the role of rogues, most sought to present themselves as privateers, that is, as legitimate agents of sanctioned violence7 ». However, pirate or privateer, career endings could still finish in the same manner. 5Execution Dock was symbolically located far enough offshore in the River Thames so as to be beyond the low-tide mark. This was because nautical crimes were dealt with by the Admiralty who held no territorial jurisdiction over the land, so maritime justice took place « on water ». Anybody who had committed crimes on the seas, either in home waters or abroad, would eventually be brought back to London and tried by the High Court of Admiralty. Piracy had originally been brought under the jurisdiction of the Admiralty court with Henry VIII’s law of 1536, although the High Court of Admiralty had actually been established the year before to suppress piracy, and their courts operated with juries. 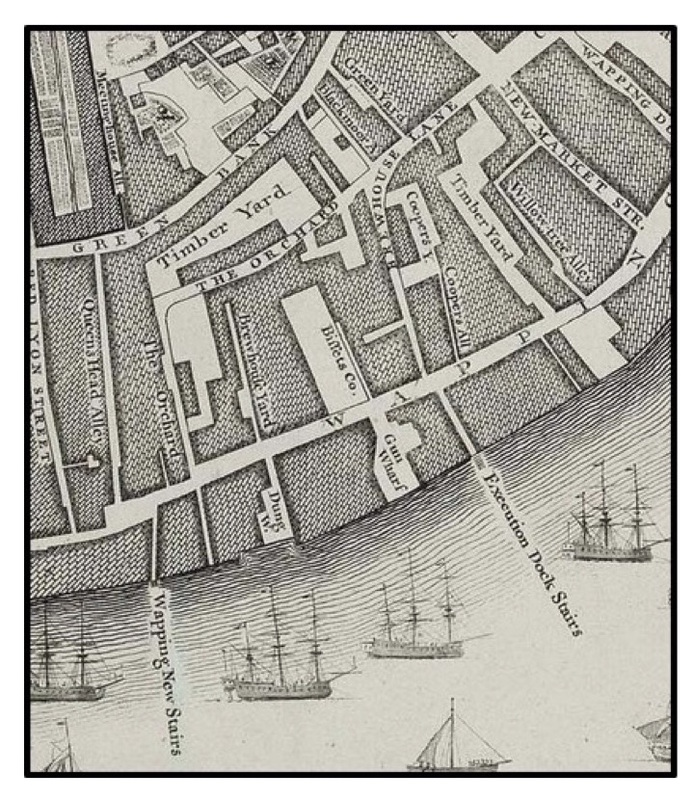 6Pirates who were sentenced to death were usually brought to Execution Dock from Marshalsea Prison8. The condemned man, or woman, travelled across London Bridge past the Tower of London in a cart, and was accompanied by a chaplain. The procession was led by the High Court Marshal, or his deputy, riding on horseback carrying a silver oar. The oar represented the authority of the Admiralty over crimes committed at sea (this jurisdiction also covered estuaries and rivers). Just like the execution procession to Tyburn, condemned prisoners were often allowed to drink a quart of ale at a public house on the way to the gallows. Boats and people crowded the river and its banks in order to watch the hangings. 7Hanging was done with a shortened rope. This meant a slow death from strangulation on the scaffold as the drop was insufficient to break the prisoner’s neck. It was called the Marshal’s dance because the condemned man’s limbs would often be seen to « dance » from slow asphyxiation. The bodies of the executed criminals were usually left hanging on the nooses, or were chained to the shoreline, until at least three tides had washed over their bodies. Some were then gibbeted for long periods of time along the river or coastline as a warning to others. Captain Kidd’s body was left exposed for three years in a cage following his execution at Wapping in 1701. 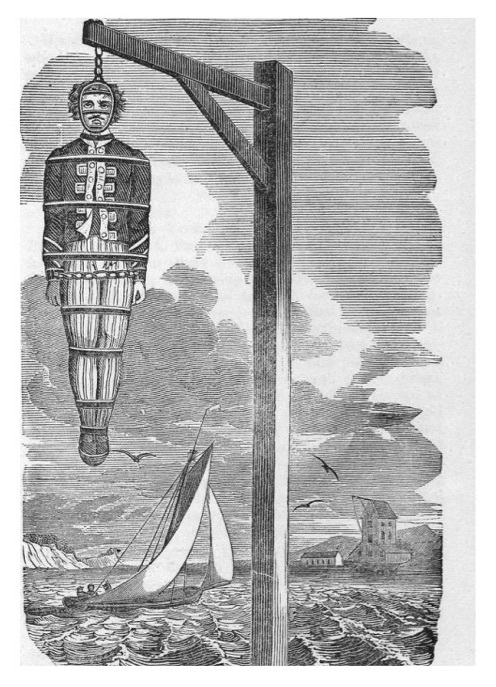 It shows the gibbeted body of Captain Kidd who was executed at Wapping in 1701. 8However, turning to the reign of Elizabeth I, we witness the hiring of pirates by the state as agents of foreign policy, particularly in the Atlantic. In 1493, the Pope’s Treaty of Tordesillas had established a line in the Atlantic beyond which only Portugal and Spain could trade. Elizabeth’s retort to England’s exclusion from such profitable trade with the Americas was piracy. Piracy then, or should I say privateering, became central to England’s imperial and commercial projects « beyond the line ». The most famous privateers in Elizabethan foreign policy included Sir Francis Drake, Sir Walter Raleigh and Sir John Hawkins. In the literary and non-literary texts of the times their privateering campaigns were often represented as patriotic Protestantism especially when such men fought against the Spanish and the Portuguese on these new trading lanes around the globe. The most successful of these English privateers was Francis Drake – one of his financiers included the Queen herself. He was seen as a national hero by the English, but as a pirate by the Spanish: « the master thief of the unknown world9 ». 9With the beginning of the Anglo-Spanish war in 1585, the state actively encouraged reprisals against enemy shipping. There were over 200 reprisal voyages against Spanish merchant ships between 1589 and 1591. This became quite common in the 1590s. Even in peacetime, privateering was permitted through the letters of reprisal, which were issued by the state authorising the recouping of losses caused by the piracy of another nation. However, due to the slow pace of news travel privateers often exploited their letters of marque as a line of defence by saying that they had only attacked another nation’s ship because they believed that their nation was still at war or had heard that war had broken out between the two states. This is the defence used by Captain Philip Boyte when he was arrested for piracy in 1580. By saying that he had heard war had broken out with Spain he believed that he was operating as a privateer not as a pirate. Unfortunately, this line of defence did not work in the case of Boyte and he was hanged at Wapping nevertheless10. 10Another line of defence was one used by Elizabeth herself, and touched upon a current legal debate of the times: the subject of national jurisdictions at sea. Was the sea common property or could nations « own » parts of it or, simply, have « control »? The debate between dominion and jurisdiction is clearly illustrated by two international jurists of the period: Alberico Gentili and Hugo Grotius who both recognised that natural law gave the right of access to the sea since the oceans could not be dominated through occupation. However, they also recognised that in certain cases nations could apply jurisdictional control to certain areas of the seas, for example, to corridors of trade (sea lanes) and to waters close to their shores. Despite Gentili’s condemnation of pirates as « the common enemies of all mankind11 » it was argued, particularly by Elizabeth Tudor, that pirates carried their sovereign’s jurisdiction with them. However, there were a number of questions left unanswered concerning the extent of territorial waters, the obligations of other nations (this bound only those nations which agreed to respect such territorial spaces) and the national ties of rogue sailors such as pirates who often sailed under mixed flags12. The arguments used by Elizabeth were that English pirates were legal actors who extended English jurisdiction into the oceans through their subjecthood and could therefore be condemned or legitimised by an English court (this was often determined by time, place and a pirate’s sponsorship). In this regard, the prize courts could provide particularly lucrative benefits to the Crown13. 15 Anna Wallace Sharp, Daring Pirate Women, Minneapolis, A&E biography, 2002, p. 47. 11However, piracy remained a huge problem around English waters as the state did not always have the material means to enforce justice and its sanctions. There was also widespread corruption amongst admiralty officials and local magistrates and in many cases pirates were pardoned in exchange for money or services rendered. Three cases illustrate this point. In the 1570s, John Callice was sentenced to death for piracy but was pardoned in exchange for helping track down other pirates. He became a pirate-hunter14. In 1582, Lady Mary Killigrew was arrested for piracy and sentenced to death but she was later pardoned following the payment of bribes by her sons15. In 1593, the Irish pirate « Queen », Grace O’Malley sent petitions to Queen Elizabeth to negotiate the release of her rebel son and her half-brother who were being held in English custody in Ireland. Elizabeth agreed in return for O’Malley turning her piracy against Spanish ships, effectively turning O’Malley into a privateer16. 14That same year the Venetian ambassador complained to James that the Lord High Admiral was abetting piracy. James replied: « By God I’ll hang the pirates with my own hands, and my Lord Admiral as well19 ». 15He directly names one pirate to be targeted, Captain John Ward22. During his reign there were more pirates executed than in any one before; nineteen were hung at Wapping in just one day in December 160823. 26 Jowitt, Claire, The Culture of Piracy, 1580-1630, Aldershot, Ashgate, 2010, p. 148. 29 Claire Jowitt, op. cit., p. 158. 16However, the navy was unable to deal with the problem. Claire Jowitt even points out that by the early XVIth century a new form of piracy was emerging: « instead of operating on short cruises of single ships, organized pirate fleets of ten or more vessels, which sometimes stayed at sea for months, had started to roam Atlantic waters24 ». Jowitt even adds that by 1609, one of these pirate fleets even had an « admiral » who, apparently, operated with a thousand men under his command25. In 1610, the Lord High Admiral was authorised to commission private ships to capture pirates because the state could not deal with the crisis26. Piracy was so endemic that in 1612 James was cornered into offering an amnesty to English pirates through a general pardon; 12 pirate captains and their crews took up this offer27. Barbara Fuchs adds an interesting footnote to her article on « Pirates, Renegadoes, and the English Nation » in which she refers to the pirate Peter Easton and his refusal to accept James’s pardon. Easton is apparently quoted as saying: « I have no intention of obeying the orders of one king when I am, in a way, a king myself28 ». As a pirate-king he had twenty ships under him. Yet, though he refused James’s offer of a pardon (on two occasions), he did accept the Duke of Savoy’s offer of asylum and the title, Marquis of Savoy29. Four years later, another pirate, Henry Mainwaring did accept James’s offer of a pardon. He was even knighted in 1618 and appointed Gentleman of the bedchamber, but historians have put this down to James’s personal liking for Mainwaring and the fact that Mainwaring never attacked English or Scottish ships. Mainwaring also helped eradicate piracy with his naval recommendations and help30. 31 Leslie Hotson, « Pirates in Parchment », The Atlantic Monthly, 1927, vol. 2, p. 212-4. 32 Vitkus, op. cit., p. 31. 17Generally though, James was against giving pardons to pirates. The example is the case of John Ward who tried to negotiate a pardon between 1608 and 1609. He offered £40,000 to the Crown for a pardon but this was refused because of diplomatic pressure from the Venetians and because Ward was also known for attacking English shipping31. Ward’s Flemish partner, Dansiker did get a pardon, but this was from the French king, Henri IV, in exchange for privateering for the French. Dansiker continued to attack Spanish and English shipping32. 33 Proceedings of the Dorset, op. cit., p. 90, 98-101. 18In order to illustrate the change in the representation of pirates under the two monarchs, it is interesting to look at the cases of Clinton Atkinson and Thomas Walton who are often referred to as the famous pirating duo, Clinton and Purser. Their stories do end in death by hanging at Execution Dock, and their piracy inspired a number of literary and non-literary texts. Clinton and Purser were successful pirates in the 1580s. Clinton had a career as both a pirate and as a privateer. In November, 1580 Clinton had been arrested for piracy and imprisoned in Exeter jail in Devon. He tried to negotiate a pardon but then managed to escape. The evidence in the state papers suggests that he was helped by local officials33. 34 Claire Jowitt (éd. ), op. cit., p. 154, 159. 35 Claire Jowitt, op. cit., p. 20. 19By 1582 though, Clinton was operating as a privateer attacking Spanish shipping with letters of marque issued by Don Antonio, a claimant to the Portuguese throne, so he was not an English privateer34. By 1583, he was again operating as a pirate. At his arrest with Purser and two others in 1583 he was tortured in The Tower and he accused local admiralty officers of collusion and corruption35. 36 Proceedings of the Dorset, op. cit., p. 106 and 108. 20Purser and Clinton, along with seven other pirates, were found guilty and condemned to death. 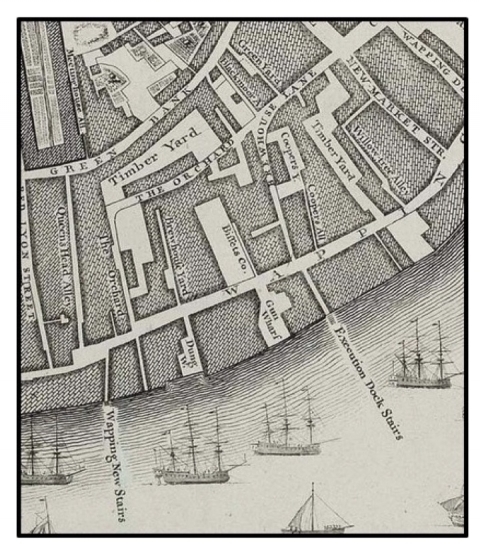 They were hung on the shoreline between low and high tide marks at Wapping on 30 August 1583. Their bodies were left on public display for three tides. Their bodies were smeared with pitch and gibbetted as a warning to others. However, one of the nine pirates, William Arnewood, was reprieved; he was a gentleman with money and influence. A petition of pardon had been presented to the court of Admiralty on his behalf and accepted by the Queen. He was released in December 1583 and resumed his piratical career36. That year 31 other pirates were also reprieved. 21The case is covered in the gallows literature of the time which is to be found in the broadsheets, ballads, pamphlets and chapbooks which were often anonymous, but were cheap and easily available to the reading public. These texts frequently include the scaffold speeches of the condemned men and formed part of the apparatus of ideological control. The farewell speech of the condemned usually followed the same form; a confession, repentance and confirmation of the justice of their sentence, and it stood as a warning to others, reinforcing obedience to the Crown along with social, religious and political conformity37. 40 Claire Jowitt (éd. ), op. cit., p. 151. 22Such gallows’ speeches appear to have been a Tudor innovation38; they exerted the values of order and submission to the Crown. However, they could also be represented as a tool of subversion which questioned the power of the state. Speeches demonstrate how a condemned man could appropriate the scene of his execution; the scaffold becomes a stage or pulpit seen as a man’s final act of subversion. This has already been largely covered by Michel Foucault’s ideas on the « spectacle of the scaffold39 » and is resumed by Claire Jowitt in her article on « Scaffold Performances: the Politics of Pirate Execution » which looks at « the subversive politics of scaffold speeches40 ». 23Following the execution of Clinton and Purser a number of texts were immediately published. The majority are now lost but an anonymous one, from 1583, is entitled, Clinton, Purser & Arnold, to their countreymen wheresoeuer. Wherein is described by their own hands their vnfeigned penitence for their offences past: their patience in welcoming their death, & their duetiful minds towardes her most excellent Maiestie41. The speeches of the three men are given, and feed into the dominant ideology of obedience to the Crown and church; the men acknowledge their sins, the justice of their sentence, and their allegiance to the monarch, and this is despite the fact, as already mentioned, that Arnold was not executed. 24John Stow, writing as a historian, published his Annales of England in 1592 and he also describes Clinton and Purser’s executions. As Walton, that is Purser, went to the gallows he gave his clothes to the hangman and to those he knew in the crowd. 42 John Stow, The Annales of England, London, Ralfe Newbery, 1592, p. 1188. 25Walton as he went toward the gallowes rent his venetian breeches of crimosin taffata, and distributed the same to such his olde acquaintance as stood about him, but Atkinson had before given his murrey velvet dublet with great gold buttons, and his like coloured venetians laid with great gold lace (apparell too sumptuous for sea rovers) which he had worne at the seas, (and wherein he was brought up prisoner from Corfe castell in the ysle of Porbecke to London) unto such friends as pleased him42. 43 Claire Jowitt (éd. ), op. cit., p. 154. 26As Claire Jowitt points out in her work on piracy, the wearing of such expensive cloth had been restricted to the social elite since the sumptuary laws of 1562 and 1574 and so the wearing of such finery by pirates at their execution might indicate one final gesture of defiance43. « Act V, Scene 2 – Near Execution Dock. 44 Claire Jowitt, « Piracy and Politics… », art. cit., p. 227-8. 30In the play little legal distinction is shown between the privateer, Young Forest, the hero of the play, and the two pirates, Clinton and Purser. They are all outlaws because they have all murdered men and taken ships. Furthermore, as Claire Jowitt demonstrates, they share the same laws of the sea; they divide the plunder on their respective ships instead of taking it to England and a prize court44. This point marks Young Forest as a pirate, the same as Clinton and Purser. However, the moral difference lies in the fact that Purser and Clinton are represented as traitorous pirates because they attack the merchant shipping of their own nation. Young Forest does not. By capturing Clinton and Purser, Young Forest is represented as a national hero; he receives a royal pardon for killing Rainsford and is rewarded with wealth and a title just like Sir Francis Drake and Sir Walter Raleigh had been under Elizabeth I, although under James I, of course, Sir Walter Raleigh was imprisoned for treason and piracy and eventually executed at the Tower. 31Thomas Heywood again writes of the case of Clinton and Purser, in his text, A true relation, of the lives and deaths of two most famous English pyrats, Purser, and Clinton in 1639. Heywood Includes excerpts from his earlier play with William Rowley, Fortune by Land and Sea. In this new text Heywood describes the careers of Clinton and Purser; how they attacked Spanish, Dutch, Turkish, French, Scottish and English shipping45. How they were finally captured, sent to Marshalsea prison, convicted and condemned. He describes the execution procession and how their bodies were left for two high tides and then given a Christian burial46. 48 Claire Jowitt, op. cit., p. 41. 33My own view follows Jowitt’s first interpretation; that in spite of the text’s sympathy for the two executed pirates the seas are now represented as being safe for mercantile navigation; merchants, explorers and travellers alike. However, the disproportionate size of the gibbets does not necessarily represent the Pillars of Hercules; they might represent the giant pillars of the law, especially since the small boat in the foreground carries an oar, which could also be a symbol of the Admiralty’s silver oar of naval justice referred to in the text (fig. 3). Fig. 3: Thomas Heywood’s A true relation, of the lives and deaths of two most famous English pyrats, Purser, and Clinton (1639). 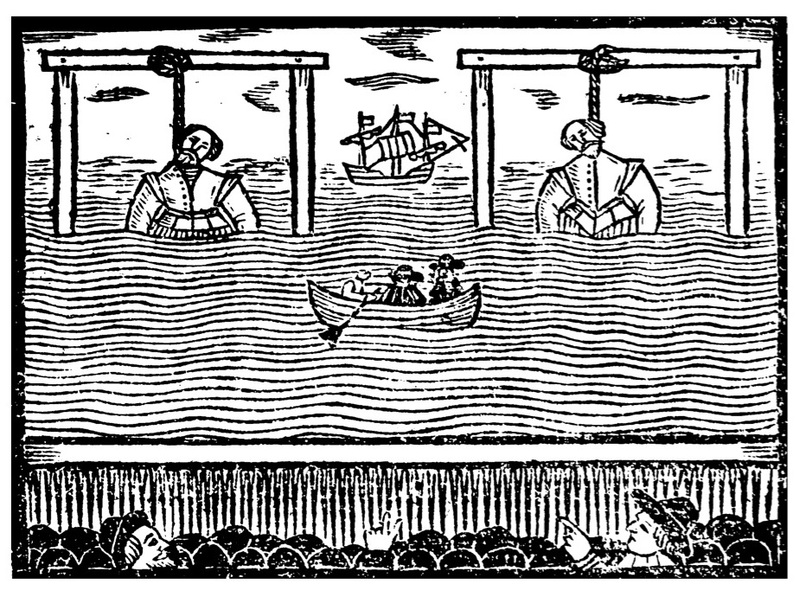 Woodcut showing their execution at Wapping in 1583. 34Generally speaking though the pirates of the literary texts were often represented as « noble outlaws49 » and became a generic feature of prose and dramatic romance. We find them in a number of Shakespeare’s plays such as Henry VI, parts 1 and 2 (c. 1592), The Merchant of Venice (1596-7), Twelfth Night (c.1600-1), Hamlet 1603-5), Antony and Cleopatra (1606-7) and Pericles (1606-9). Pirates are also found in Philip Sidney’s Old Arcadia (1580) and the New Arcadia (1590), Robert Greene’s the Pedlar’s Prophecie (1595), Christopher Marlowe’s Tamburlaine, part 1 (1587-8), Thomas Heywood’s Fair Maid of the West, part 1 (1596-1603), John Day, William Rowley and George Wilkins’s The Travels of the Three English Brothers (1607), Robert Daborne’s A Christian Turned Turk (1612) and Philip Massinger’s Renegado (1624). Whilst the execution of pirates was rarely staged there were literary references to the pirates’ gallows of Wapping, as in the 1605 play, Eastward Hoe50. Yet, even when the public execution of pirates was staged, as in Fortune by Land and Sea, the pirates were not wholly condemned. To a large extent the public remained sympathetic to pirates; they were the Robin Hoods of the seas. 35As we have seen nautical justice was dealt out in an arbitrary way and much depended on the foreign policy of England, the monarch’s disposition towards certain cases and the complicity of some admiralty magistrates. Pirates who were apprehended could defend themselves by producing letters of marque and/or by saying that they thought England was still at war with Spain, and their acts of piracy had only been an act of reprisal in the defence of England’s interests. Sometimes a prisoner could bribe their way out and escape, or use their contacts and influence in order to circulate a petition or letter asking for a royal pardon. Others turned king’s evidence giving information against other pirates and their networks in order to have their sentence commuted. Well-seasoned, and talented pirates were able to negotiate with the state in order to sell their skills in exchange for a pardon. They became pirate-hunters and/or privateers giving a percentage of their booty to the monarch. Some accepted an amnesty and gave up piracy altogether but there were others still who refused the offer of an English amnesty but accepted one from another nation especially if a royal title was on offer too. A lot depended on the pirate’s pecuniary situation, his family connections and social class. 36The more unfortunate pirates were executed on the gallows at Execution Dock and hung there as a warning to others to play by the rules of the game. Under Elizabeth this meant they had to work as a private-man-of-war for the state and never attack the shipping of their own nation or, like Clinton and Purser, they would forfeit their lives. Under James privateering and piracy were one and the same thing and there was a clamp down on all forms of piracy. Not only were there more hangings but pirates had their goods and properties confiscated and, like ward, they also lost their subjecthood, and were outlawed as traitors. Anonymous, Clinton, Purser & Arnold, to their contreymen wheresoever, London, John Wolfe, 1583. Day John, Rowley William, Wilkins George, The Travels of the Three English Brothers, London, John Wright, 1607. Heywood Thomas, Fair Maid of the West parts I and II (1597-1603/1620), Lincoln, University of Nebraska, 1967. Heywood Thomas, A True Relation, of the Lives and Deaths of the two most Famous English Pyrats, Purser, and Clinton; who lived in the Reigne of Queene Elizabeth, London, John Oakes, 1639. Heywood Thomas, Rowley William, Fortune by Land and Sea (c. 1607-9), Massachusetts, Clarke Company, 1899. Jonson Ben, Chapman George, Marston John, Eastward Hoe, London, William Aspley, 1605. Shakespeare William, Pericles (1606-1609), The Merchant of Venice (1596-8), Hamlet (1599-1602), Twelfth Night (1600-1), Measure for Measure (1601-1606), in Stratford Shakespeare : All 37 Plays, All 160 Sonnets and Poems, London, Chancellor Press, 1982. Stow John, The Annales of England. London, Ralfe Newberry, 1592. Stow John, Survey of London. London, John Wolfe, 1598. Sydney Philip, The Countess of Pembroke’s Arcadia, London, William Ponsonbie, 1590. Vitkus Daniel (éd. ), Three Turk Plays from Early Modern England: Selimus, A Christian Turned Turk, The Renegado, Columbia University Press, New York, 2000. Appleby John C., Under the Bloody Flag: Pirates of the Tudor Age, Stroud, Gloucestershire, The History Press, 2009. Bak Greg, Barbary Pirate: the Life and Crimes of John Ward, Stroud, Gloucestershire, The History Press, 2010. Benton Lauren, A Search for Sovereignty: Law and Geography in European Empires, 1400-1900, Cambridge, Cambridge University Press, 2010. Chambers Anne, Granuaile: Grace O’Malley – Ireland’s Pirate Queen, Dublin, Gill & Macmillan Ltd, 1998. Fuchs Barbara, « Faithless Empires: Pirates, Renegadoes, and the English Nation », ELH, 2000, vol. 67, n° 1, p. 45-69. Fuchs Barbara, Mimesis and Empire: The New World, Islam, and European Identities, Cambridge, Cambridge University Press, 2001. Hotson Leslie, « Pirates in Parchment », The Atlantic Monthly, 1927, vol. 2, p. 208-15. Jowitt Claire, The Culture of Piracy, 1580-1630, Aldershot, Ashgate, 2010. Jowitt Claire (éd. ), Pirates? The Politics of Plunder: 1550-1650, Basingstoke, Palgrave, 2007. Jowitt Claire, « Piracy and Politics in Heywood and Rowley’s Fortune by Land and Sea (1607-9) », Renaissance Studies, 2002, vol. 16, n° 2, p. 217-33. Jowitt Claire, « Elizabeth among the Pirates: Gender and the Politics of Piracy in Thomas Heywood’s The Fair Maid of the West, Part I », in Charles Beem (éd. ), The Foreign Relations of Elizabeth I, New York, Palgrave Macmillan, 2011. Jowitt Claire, « Shakespeare’s Pirates: The Politics of Seaborne Crime », Shakespeare Jahrbuch, 2012, vol. 148. L’Estrange Ewen, « The Pirates of Purbeck », Proceedings of the Dorset Natural History and Archaeological Society, 1950, vol. 71, p. 88-109. McDermott James, Martin Frobisher: Elizabethan Privateer, New Haven, 2001. Sharpe J. A., « “Last Dying Speeches”: Religion, Ideology and Public Execution in Seventeenth-Century England », Past and Present : A Journal of Scientific History, 1952, p. 144-67. Wallace Sharp Anna, Daring Pirate Women, Minneapolis, A&E biography, 2002. Yetter Leigh (éd. ), Public Executions in England, 1573-1868, parts I and II, London, Pickering and Chatto publishers, 2009-2010. 4 James Sharpe, « Last Dying Speeches : Religion, Ideology and Public Execution in Seventeenth-Century England », Past and Present: A Journal of Scientific History, 1952, p. 167. See also Leigh Yetter (éd. ), Public Executions in England, 1573-1868, parts I and II, London, Pickering and Chatto publishers, 2009-2010. 5 Corsairs were pirates, sponsored by such Barbary states as Salee, Tunis, Tripoli and Algiers. Many corsairs were Europeans, called renegades, who sought their fortune with these North African states, many even « turned Turk »; they converted to Islam. See Claire Jowitt (éd. ), Pirates? The Politics of Plunder; 1550-1650, Basingstoke, Palgrave, 2007, p. 29-30. 6 Claire Jowitt, « Elizabeth among the Pirates: Gender and the Politics of Piracy in Thomas Heywood’s The Fair Maid of the West, Part I », in Charles Beem (éd. ), The Foreign Relations of Elizabeth I, New York, Palgrave Macmillan, 2011, p. 131. 8 This was a privately-run prison in south London for men and women generally committed for crimes at sea. It was comfortable, for those who could pay. 9 John Stow, reporting the Spanish ambassador. See Claire Jowitt, The Culture of Piracy, 1580-1630, Aldershot, Ashgate, 2010, p. 9. 10 Ewen L’Estrange, « The Pirates of Purbeck », Proceedings of the Dorset Natural History and Archaeological Society, 1950, vol. 71, p. 89. 11 Lauren Benton, A Search for Sovereignty: Law and Geography in European Empires, 1400-1900, Cambridge, Cambridge University Press, 2010, p. 125. 12 Ibid. For more detailed information about this early modern debate see Lauren Benton’s chapter, « Sovereignty at Sea: Jurisdiction, Piracy and the Origins of Ocean Regionalism », in Lauren Benton, A Search for Sovereignty: Law and Geography in European Empires, 1400-1900, Cambridge, Cambridge University Press, 2010, p. 104-161. 13 Martin Frobisher was a state-sponsored privateer who attempted to find the north-west passage for the Crown. A promising asset for England’s trade ambitions in the Indian Ocean, he was never brought to trial for piracy despite being arrested for piracy on several occasions in the 1560s. See James McDermott, Martin Frobisher: Elizabethan Privateer, New Haven - London, Yale University Press, 2001. 14 Jowitt, Claire (éd. ), Pirates? The Politics of Plunder: 1550-1650, Basingstoke, Palgrave, 2007, p. 34. 16 Anne Chambers, « The Meeting of the Two Queens », Granuaile: Grace O’Malley – Ireland’s Pirate Queen, Dublin, Gill & Macmillan, 1998, p. 106-124. 17 Captain John Smith, The Complete Works of Capt. John Smith, Philip Barbour (ed. ), London, 1986, 3 vols, II, 914. Quoted in Claire Jowitt, « Piracy and Politics in Heywood and Rowley’s Fortune by Land and Sea (1607 9) », Renaissance Studies, 2002, vol. 16, n° 2, p. 217-233. 18 « A Proclamation concerning Warlike ships at Sea », Greenwich, 23 June 1603, in Larkin and Hughes, Stuart Royal Proclamations, vol. 1, p. 30-31. Quoted in Claire Jowitt, art. cit., p. 219. 20 « A Royal Proclamation: By the King. A Proclamation against Pirates (Whitehall, 8 January 1609) », Vitkus, Daniel (ed.) Three Turk Plays from Early Modern England: Selimus, A Christian Turned Turk, The Renegado, Columbia University Press, 2000, Appendix, p. 353. 23 Claire Jowitt, « Shakespeare’s Pirates: The Politics of Seaborne Crime », Shakespeare Jahrbuch, 2012, vol. 148, p. 4. 28 Barbara Fuchs, « Faithless Empires: Pirates, Renegadoes, and the English Nation », ELH, 2000, vol. 67, n° 1, fn. 26, p. 69. 37 James Sharpe’s article, « Last Dying Speeches » is of particular interest here, op. cit., p. 144-67. 39 « L’éclat des supplices » of Michel Foucault: Michel Foucault, Surveiller et Punir. Naissance de la prison, Paris, Gallimard, 1975. 41 Anonymous, Clinton, Purser & Arnold, to their countreymen wheresoeuer. Wherein is described by their own hands their vnfeigned penitence for their offences past: their patience in welcoming their death, & their duetiful minds towardes her most excellent Maiestie, London, John Wolfe, 1583. 45 Thomas Heywood, William Rowley, A True Relation, of the Lives and Deaths of the two most Famous English Pyrats, Purser, and Clinton; who lived in the Reigne of Queene Elizabeth, London, John Oakes, 1639, part I, chapter 5. 46 Ibid., part II, chapter 4: « The manner how they were taken, and by whom ; and what manner of death they dyed : and where ». 49 Christopher Harding, « “Hostis Humani Generis” – The Pirate as Outlaw in the Early Modern Law of the Sea », in Claire Jowitt (éd. ), op. cit., p. 35. 50 Ben Jonson, George Chapman, John Marston, Eastward Hoe, London, William Aspley, 1605, IV, i, 125-130. Maître de conférences en langue et littérature anglaises (fin du Moyen Âge/Renaissance) - Université d’Orléans, Centre d’Études Supérieures Sur la Fin du Moyen Âge (CESFiMA), POuvoirs, LEttres, Normes (POLEN, EA4710).